When you search for Mormons on a search engine, chances are you will find a lot of negative pages filled with things that are either opinions or completely untrue stated as facts. Your best bet for finding out about the Church Of Jesus Christ Of Later-Day Saints (the official name of the church) Would be to find one and ask them. If you don't know anyone who belongs to the church try this link, LDS.org It has a lot of information and will probably answer most of your questions. What's it like living around all those Mormons? 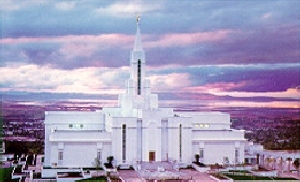 Living among the Mormons is just like living in any other State with a predominant riligion. Like living in the Bible Belt or anything else. It's not really a big thing. Mormons are just like anyone else. You can meet a member of the church on the street and have a converstion with them and not even know you met one. It is true that in the history of the church, pologamy was practiced. They don't do that anymore. About the same time Utah became a state that practice stopped. Anyone who practices plural marriage now is kicked out of the church. (And also arrested because it is afterall illegal). What are those temples they have? The temples are for practicing sacred ceremonies. Not just anyone can enter the temple. You have to be a member of the church in good standing and have a reccomend from the bishop. Most temples do however have a visitor's center where you can ask questions and get more information. If you are going to be in an area where there is a Mormon Temple, a tour of the grounds and a visit to the vistior's center is worth your time. Visiting the Salt Lake temple is an intersting and enlightning experience even though you are not allowed inside the actual temple. Don't they have a lot of rules? It is true that the Mormons do have a strict code of conduct. The "Word of Wisdom" discourages drinking and smoking. Their religion teaches abstinance until marriage. (good ideas anyway, we all know how dangerous these things can be). The church encourages service and charity. The LDS church has it's own welfare program where those who recieve assistance are required to work off the money they recieve in church charities. The church has canneries where they can food for the poor and for food banks. The church also owns Deseret Industries where jobs are provided for handicaped and other people who have a hard time finding a job. It is a second hand store where all murchandise is donated then repaired and sold at a discount. There are many other Chruch Organazitions that are too numerous to list check out the LDS site for more information.LDS.org Members are encouraged to volunteer their time in one of these organazations or to just help a neighbor in need. Many members perform functions in their church such as sunday school teachers or clerks, for which they are not paid. What about all those weird words they use? this is an organization of the church usually by neighborhood who all go to church and worship at the same time in the same building. Similar to a parish. Similar to a ward only larger. A stake consists of several wards. Most LDS young men go on a mission when they are 19. They leave home and go to another state or country to share their religion. They are gone for 2 years. Special underwear worn by faithful members of the Church who have gone through certain ceremonies in the temple to remind them of how they should be living.